If you live in the Midwest or plains area, chances are, you are very aware. Tornado season in these places is well-known and dreaded; a time that comes every year and must be prepared for. Roaring in like a freight train, a tornado rips right out of the sky and can do major damage. Their season typically begins in late winter and ends in late summer, moving from the south to the north. Spring brings about these monster storms because the warm, moist air moves up from the south and collides with colder air from the north. “Tornado Alley” is the name for the region most affected by tornadoes in the United States. This includes the Great Plains states of Kansas, Nebraska, and the Dakotas, as well as parts of Texas. However, tornadoes have been known to touch down as far South and East as the Southern tip of Florida. The tornado season timeline goes something like this: Southern States, March to May. Southern Plains, May to early June. Gulf Coast, March to May. About 700 tornadoes are seen in the United States each year. One of the most alarming things about tornadoes is their unpredictability. Their path is aimless, and their furious winds can pull trees right out of the earth—not to mention homes and vehicles off the ground, and roughly 60 deaths occur annually due to flying debris caused by tornado winds, which are the fastest winds on the planet, capable of spinning at 250 miles an hour (although the most average speed is 110 miles per hour). They are extremely violent, and very mysterious. 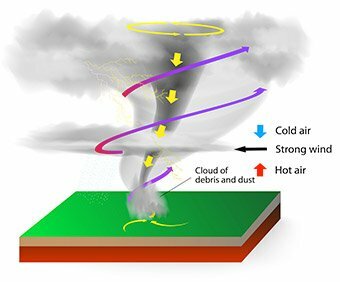 Weather scientists have never fully been able to understand what truly causes them, although they do know that tornadoes have to form under a certain set of weather conditions, which includes how three different types of air come together. A parent supercell storm (basically a terrifying thunderstorm) is also needed to form a tornado. There are theories about how strongly the wind changes direction with the amount of moisture in the air, height, and temperature differences. A layer of warm, humid air lies near the ground, while colder air lies in the upper atmosphere. These temperature and moisture differences create an “upset” which can form tornadoes, and then a third layer of air is formed. This one is hot and dry, and makes all this air even more upset. Eventually this erupts into an angry thunderstorm, with the wind rotation being formed when there is a change in wind speed. This creates a funnel, and when the funnel gets weighed down by rain and hail, it touches down—causing a tornado. Because of this, tornadoes are also notoriously difficult to forecast, and as mentioned before, they have an aimless zigzag path that seems to be controlled by nothing—although scientists believe the path is determined by the winds of the thunderstorm that’s carrying the tornado. You may be wondering how long a tornado can last. If you’ve been through one, you know that it can feel like forever. But the truth is, most tornadoes don’t exceed ten minutes. They can last up to an hour, but the average time limit tends to be around the ten-minute mark. Sadly, that’s all the time they need. Tornadoes can completely destroy a large area of land in just a few minutes, which is why it’s so important to take precautions and to expect the unexpected when it comes to dealing with them. If you’re a business owner who lives in a high-risk tornado area, you may want to consider a few things to ensure that your building and business are protected and able to continue operating even within a disaster. 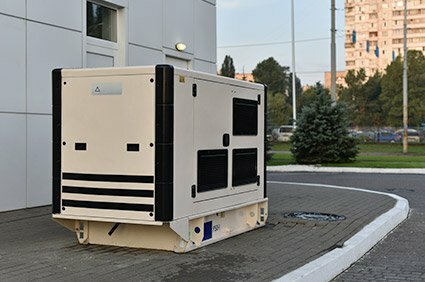 It’s a good idea to think about a commercial generator in case of power outages (just ask any company without one. They’ll tell you!) Also be sure you have an emergency plan for communicating with your employees—and make sure it to test it ahead of time with a drill. Have a trusted software in place that will ensure your company’s digital files are backed up in the event that your business does get demolished. Even if your building gets torn to pieces, having your clients’ records backed up elsewhere can help your company get back on its feet much sooner than it would without that software. With a good backup software for your digital files, tornadoes will have a harder time interrupting your revenue stream or causing your business to shut down. Maybe you haven’t yet begun digitizing your company’s paperwork, but just imagine this. If you’re not already using a content management system for work, it’s time to start. All that paperwork in your file cabinets could be stored in a safe, secure system that will always be backed up in the event of severe weather conditions. Besides the obvious safety, having your company’s files digitized is simply more convenient: no more file cabinets; no more tall stacks of endless papers; and much, much happier employees who can access data by clicking a mouse instead of searching through piles. Digitizing is also better than physical paperwork because it’s much more secure. Never mind the tornadoes— security is a constant concern even more than natural disaster. With an enterprise content management solution, you can control who sees what at all times. At the very minimum, digitized data should include financial and accounting records, corporate documents, customer contracts, orders, inventory, and HR records. Just imagine if all these were destroyed and you could never retrieve them. 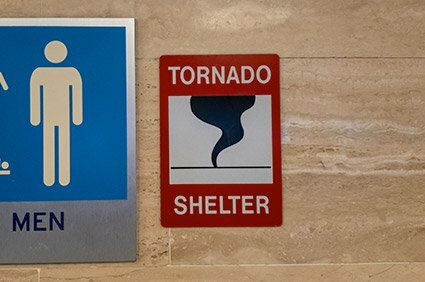 When it comes to physical practices for tornado safety, it’s also a good idea to brace or strap the roof of your building, make entry doors more wind-resistant, and even think about building a “safe room” in the building to protect against tornadoes. Think it can’t happen to your business? 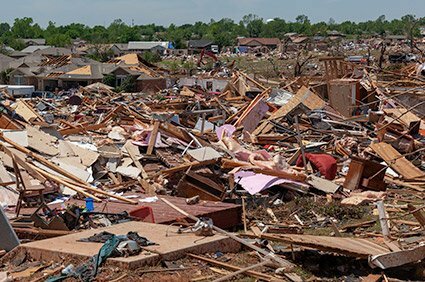 In May 2011, a multiple-vortex tornado struck Joplin, Missouri and hit business owner John Motazedi’s IT company, reducing the building to a pile of rubble. This would be devastating for any business, but with John Motazedi’s, it was much more serious. The town’s doctors depended on his IT company for digitized files in order to care for their patients and verify prescriptions. “It was peoples’ lives, records,” said Motazedi. Fortunately, John Motazedi was able to rely on owners of similar IT companies in nearby states. Help immediately began showing up the next day, and soon Motazedi was greeted with an emergency shipments of computer parts, software, cash flow, and assistance. Not so fortunate was Bare Knuckle Choppers of Hawk Point, Missouri, four years later, when another tornado—this one with 110-mile winds—destroyed this motorcycle business. A lifetime collection of bikes, parts, and tools was totally obliterated in one evening, not to mention their records of sales, receipts, and invoices. The much-loved business has gone through rebuilding and received a lot of support from the community, but their loss will never be fully restored. The tornado outlook for 2019 predicts the United States to see between 470 and 550 tornadoes, likely around 511. 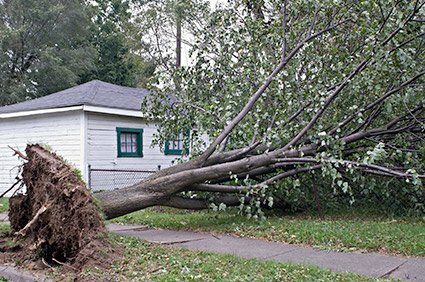 Don’t let one of those do serious damage to you or your property. If you’re looking for content management solutions for tornado season or for any other reason, we at Contentverse are your experts. Let us help answer your questions today! A version of this article was originally published as Tornado Season is Here? Are You Prepared? on March 30th, 2016.